Medical assistants are in demand in Arkansas; today there are just over 2,000 employed in the state of Arkansas, with another 470 expected to be employed between 2012 and 2022. They might find work in offices of physicians, which is the most common employer, but they might also work in home health, outpatient care centers, nursing homes and more. This guide is designed to delve deep into the work of medical assistants in Arkansas, including what aspiring graduates can expect after graduation. With the various options for medical assisting programs in Arkansas, it can be a challenge to find just the right one. Medical assistants work directly with patients and physicians in a professional health care setting, helping to serve the community as a whole. The job market continues to grow, making it a lucrative career opportunity for those looking to go into the field. We did some research for you, looking at class sizes, student services, the number of degrees available and more to bring you our list of the 2017 Top Schools for Medical Assisting in Arkansas. Cossatot Community College of the University of Arkansas offers technical certificate in medical assisting at just under 40 credits, allowing students to begin the process of becoming a medical assistant without worrying about spending too much time in school. Students who complete this degree will be able to demonstrate a comprehensive understanding of necessary medical terminology, medical office management, and legal and ethical practices in relation to medicine. CCCAU hosts several student organizations on their campuses, allowing students to socialize with one another in their extracurricular time. CCCAU student resources—academic advisement or disability resources, for example—help to keep students on the most productive path to graduation. The associate of applied science degree in medical assisting technology available at East Arkansas Community College provides students with the added specialization of an emphasis in medical coding. Students will develop basic filing and records management skills, a comprehensive understanding of medical terminology, and a base knowledge of general education to make them into a well-rounded student. Depending on the program they pursue, graduates from EACC have the option to transfer to a four-year school and continue their learning in a bachelor’s degree program, or to enter into the workforce after just two years of learning. Completing Mid-South Community College’s medical assisting program is an excellent way for students to begin a career as a medical assistant in a variety of medical settings. This program's curriculum revolves around developing students’ understanding of medical terminology, human anatomy and physiology, and basic administrative procedures necessary for proper medical office management. Mid-South employs one-on-one tutors, academic advisors, and career counselors to help guarantee students don't fall behind in their learning. Students may also choose to learn in an online format, allowing them to benefit from a comprehensive Mid-South education without disrupting their daily schedules. Medical assistants must earn the proper training in order to become certified. Medical assisting schools in Arkansas offer everything from a certificate to an associate's degree. Learn what Arkansas Tech University offers aspiring medical assistant students. The Arkansas Tech University associate degree program offers students a wide variety of courses that will prepare them for both clinical and administrative tasks. After graduation, students will be ready to take the Certified Medical Assistant exam. Only the associate degree in medical assisting is available to students at Arkansas Tech University. This degree consists of 60 credits, which takes two years to finish. How does Arkansas define "medical assistant"? According to Regulation 31 of the Arkansas Medical Board, a medical assistant is defined as an employee of a physician who has been delegated medical practices or tasks, and who has not been licensed by or specifically authorized to perform the practice of task pursuant to other provisions or Arkansas law. The regulation sets forth mandatory guidelines a physician must follow when delegating any procedures to a medical assistant, yet still gives the physician a great deal of discretion in choosing what is appropriate to delegate. Is certification required in the state? 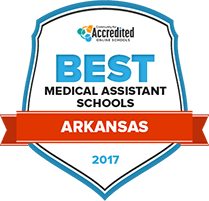 Though medical assistant certification is not required in Arkansas, some employers may prefer to hire someone who has been certified, and thus can prove certain knowledge and skills relating to medical assisting. Unlike some states, there is technically no formal training or education requirement in place for medical assisting in Arkansas. Are there tasks outside the scope of medical assistants in Arkansas? In addition, physicians can only transfer delegation to other physicians; they cannot turn to registered nurses or other healthcare providers to delegate tasks to medical assistants. How does payment for Arkansas medical assistants stack up against the rest of the nation? Here's a comparison on wages based on both hourly and annual medians. There are numerous factors that play into the salaries of medical assistants, including certification status, formal training or education, years of experience and more. Geography is also a factor; where in the state someone works has a strong influence on their bottom line. Here's what medical assistants make across the state. The chart below illustrates the growing need for medical assistants in Arkansas, as well as how state growth compares to the national average. This regulation is designed to explain the scope of what physicians are allowed to delegate to medical assistants while still allowing for a great deal of discretion. Arkansas' law regulating the practice of medicine, including what tasks physicians can delegate to medical assistants. The Arkansas Society of Medical Assistants has the goal of improving patient care provided by medical assistants through the education and advocacy of the profession.